Michael Grabner burst past Jake Voracek for a loose puck and scored a shorthanded goal in the second period, but the Flyers winger made amends in the overtime as he made a hard-working play to set up Shayne Gostisbehere’s winner. Voracek also made amends for the Flyers’ only loss on their recent 3-0-1 road trip. In that OT defeat in San Jose, Logan Couture won a puck battle with Voracek and fed Timo Meier for the winning goal. Thursday, it was Voracek who set up the winner. Voracek found Gostisbehere, who cheated and moved into the right circle, and the defenseman deposited the sixth OT winner of his career. Afterward, Gostisbehere celebrated with his grandfather, who got him interested in hockey when he was a youngster. His grandfather, Denis Brodeur, traveled from Florida and plans to attend all five games of the homestand. “Living the dream,” Brodeur said after watching his grandson win Thursday’s game. Goalie Brian Elliott was banged up from a recent collision in practice with Travis Konecny and from getting hit on his mask with a shot. Still, after not starting the last three games (one for the injury), he was deemed ready to serve as Cal Pickard’s backup Thursday. And when Pickard allowed four goals on 16 shots and the Flyers faced a 4-2 deficit, Elliott replaced him early in the second period. The 33-year-old goalie showed no ill effects from his injury and put together a relief performance that would have made Craig Kimbrel proud, stopping all 16 shots he faced. Once again, the Flyers’ special teams struggled mightily. Arizona outscored the Flyers, 3-0, in the special-teams battle, getting two shorthanded goals on the same penalty kill and adding a power-play goal. The Flyers were 0-for-4 on the power play, and were outscored, 2-0, while they had a man advantage. 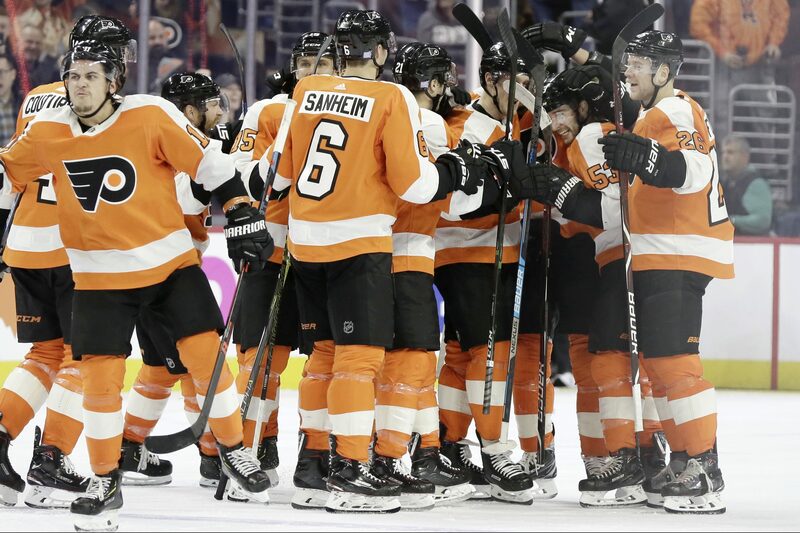 Before Thursday, the Flyers had allowed two shorthanded goals on the same shift twice in franchise history (2012 vs. Pittsburgh, and 1969 vs. Chicago) and lost both those games. Since their opener in Las Vegas, the Flyers have gone 15 straight games without outscoring their opponents on the power play. That makes it pretty amazing they are over .500 (8-7-1). By the way, if you’re keeping track at home, the Flyers have allowed at least one power-play goal in nine straight games. The power-play goal they surrendered in the first period Thursday cut their lead to 2-1. It started a streak in which Arizona scored four straight goals. After a Western swing in which he struggled, Scott Laughton had a stellar game. Laughton played just 9:14 but had a pair of goals, three hits, and two takeaways. Laughton got the Flyers to within 4-3 early in the third period, helping erase the memory of the team’s awful second period, when they were outshot, 15-7, and outscored, 3-0. The Flyers dominated the third. Weise has been playing solidly — he was recently promoted to the third line — but had yet to score a goal until he netted a game-tying breakaway with 2:13 left in regulation. Gostisbehere made a slick pass to send him in alone. That said, this one came at the most opportune time.